As a nurse it didn’t take Sandy Collins long to figure out what was going on. 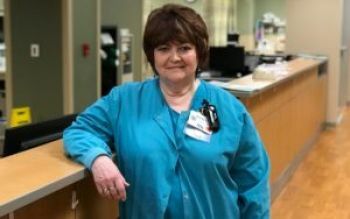 She had just returned from lunch and was standing at a nurse’s station in the Post Anesthesia Care Unit at Reid Health. She suddenly became dizzy. Her left arm drew to her side. Her leg went numb. “I told one of my coworkers – ‘I think I’m having a stroke.’ They took me straight to emergency” recalls Sandy Collins of the June 2017 experience. She knew symptoms and how urgently important time is when someone suffers a stroke. Quick treatment can be the difference between life and death life-changing damage and even what options can be used for treatment. The Richmond resident is really glad it happened while she was at work with an emergency room nearby. Within less than two hours from when the blood clot struck in her brain she received a clot-busting drug treatment and was already regaining movement in her arm and leg. Collins now 71 had always been healthy and did not know before her stroke that she had an issue with blood pressure. “My blood pressure was sky high but I didn’t know it” she says. She never forgets to take her medicines and stays on top of her medical appointments and her health.